So much of the moth class history had gone missing. Few people appreciated the interest there would be in old yearbooks, photos, design drawings and articles. But it seems Mothies are horders and since we posted this page, over 200 photos and scans have been sent in. This page features yearbooks, brochures, posters etc. And the ‘archive pics’ pages have period photos. 1973 yearbook just check the list of members at the back. Some seriously successful sailors were learning their racecraft in Moths that cost £200 new! 1976 yearbook the magnum II makes an entry that was to revolutionise the class and john claridge was clocked at an impressive 14.5 knots! 1980 yearbook includes a picture of Casper De Graaf’s very narrow design, which was much too heavy. the nationals was a two horse race between the iszatt brothers with mike losing out to david in the final race by one second. 1981 yearbook a great year for mothing with many characters: David Iszatt, John Butler, Colin Evans, Jim Prower, Robin Wood, Chris Cottrill, Peter Conway, Simon Allen, Sean Cox,Roger Angell, John Claridge, and Toby Collyer to name a few. 1982 yearbook Dave iszatt makes it a triple title. 1986 yearbook the year of roger angell (world, national and UK champion) and the magnum v and vi. hulls as light as 45 lbs! a young toby collyer is waiting in the wings. 1989 yearbook featuring steve reece, john claridge, mark stead, rob cambell, martin saveker, jason belben, si payne, roger angell, clive everest, toby collyer, melvyn cooper, john pierce, ian ridge and andy patterson: one or two of whom went on to be quite good sailors! 1990 yearbook featuring two pictures of si payne capsizing with hair! the dawning of the modern era with spaceframes narrowing hulls and at least one set of net tramps. featuring magnum 8, axeman, aero II, blitz I, goul 2, gentleman jim designs plus an article on wing masts by clive everest. 1994 yearbook a classic one this including ‘my first year of mothing’ by junior champ ???? (see pic right). plus the skippy mk 1 arrives. yet another milestone design. 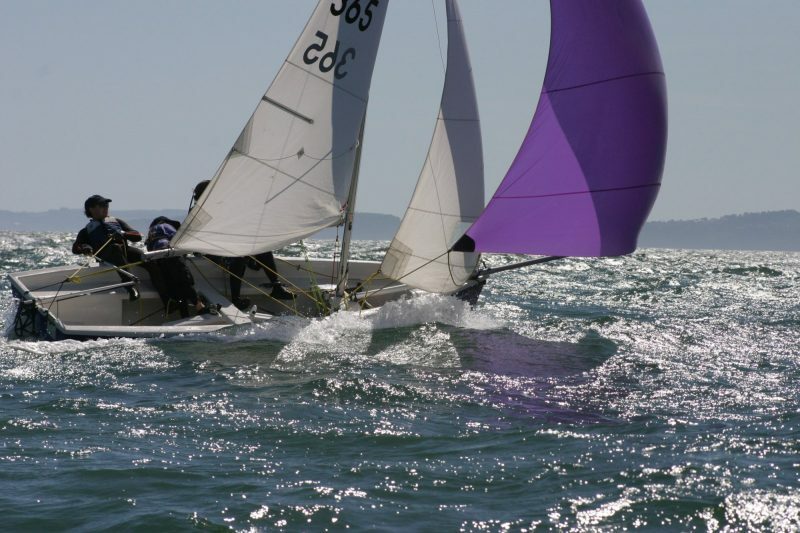 of even bigger impact was the first T foil rudder explained in john claridge’s article. 1997 yearbook yet more revolution with mark thorpe’s article on his new sleeve luff rig. nick spence wins the worlds for the UK with mark second. OK it’s time to bring this section up to date. We want to make it a mine of information on Moth and foil design, technology and building. If you are involved in any way and want to publish ideas or experiments, please send them in and I’ll make you a page. Students’ papers are especially welcome and can be posted in pdf format. Adam May writes – The front of the foil is the key with the ventilation problem. The link is a screen grab from a simple cfd program showing the pressure distribution around a typical 0012 section foil at 4 degrees angle of attack. You can see the large suction peak near the nose on the upper surface. On the right, is a photo of a nicely ventilated rudder, but control is retained enough that I could get a camera out and take a photo of it! I use one fence about 120mm up from the rudder foil wrapping around the front. It doesn’t prevent ventilation but when it happens it enables you to keep control. Fence design is quite well documented when you start looking into it. I have used the braided PBO by Gottifredi Maffioli which you splice your self, and the stuff you buy pre made from Easy rigging. The Easy rigging is the lower stretch and lower windage route but not as durable and more expensive. I broke the plastic cover on two sets on my 14 — one from spin sheet wear and one from spreader wear. Both breakage’s are probably 14 specific and not a problem on the moth. The Gottifredi has been on my I14 for 2 seasons — Same set no problems. It has very robust spectra cover. The easy rigging has a plastic cover which will only take limited abrasion and load — ie if a spreader grips the cover before the stay is tight the cover will snap exposing the fiber which degrades quickly in day light. My latest set from Easy now have Dacron cover. Thicker but durable. I used 4mm Braided vectran on my forestay ( i14) until i started with the pbo and it held rig tension ok, but it takes more travel in the rig purchase systems to get to load. Once there it worked just fine holding the same static load as wire. I tried 3mm vecrtan on the uppers shrouds but could never get them to load as the system didn’t have enough travel. I never tried Dyneema due to the creep ( elongation without recovery). I believe Marlow have developed some creepless dynemma recently but i have not used it.